This Is What Panics The Eco-Fascists? 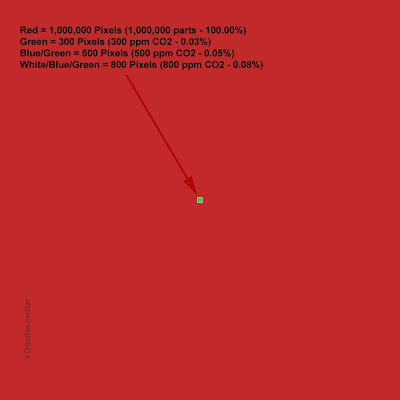 What Does 800 ppm CO2 Look Like vs. 300 ppm? Eco-fascists, such as Al Gore and his useful-idiots, are attempting to convince the public that if CO2 in the atmosphere grows from green-to-blue-and-then-to-white (see below chart) the following will happen:1. Greenland ice sheet will slip off Greenland and flood the world. 2. Antarctic ice sheets will melt and drown the world’s coast lines. 3. Millions of species will become extinct. 4. The ocean conveyor belt will slow down, thus freezing Europe. 5. Mass starvation will occur because crops will fail from drought. 6. Severe hurricanes and floods will wreck the planet. 7. Polar bears will lose their food source because there is no more Arctic ice. 8. Millions, possibly hundreds of millions, will perish from heat waves. 9. Tropical diseases will spread from pole to pole. 10. And, etc, ad nauseum.They say not only will this happen, but Democrat House Representatives (+8) insist the above has already started.Is it even remotely reasonable to wildly claim the world will suffer the above or become “unlivable” because of a ‘green-to-blue-to-white’ CO2 change as depicted below in the actual representation of CO2 growth? Can Al Gore and the eco-fascists produce a list of even 250 physical scientists who will actually sign a petition that states that going from ‘green-to-blue-to-white’ will actually cause the above catastrophic effects (claims)? To give Al Gore and the useful-idiots a little competitive challenge, here’s a list of 31,000 scientists (9,000+ PhD’s) who say the below (see chart) will not cause the above events to happen. (Click to enlarge) Note: If you are on speaking terms with a useful-idiot, a public school teacher, a Hollywood celebrity, a CNN reporter, or a Senator who believes Al Gore fanatical claims, share this chart with them. Explain to them, very slowly, that this is why the vast majority of climate alarmist scientists (or even a decent number of physical science scientists) will not sign a petition categorically stating they believe that small trace amounts of human CO2 will cause global catastrophes, as claimed by Al Gore and other eco-fascists. The reason they won’t is because the claims are literally non-scientific hysteria.